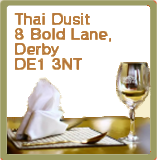 Our menus offers an extensive range of classic Thai dishes. For ease of viewing it is split into the following sections: Starters, Mains, Lunch, Set Menu, Dessert. To view any of these sections please select one of the buttons above.